Name The name used to refer to the business unit in the UI. This is the only mandatory field. Parent Business Unit Define the business unit to which this business unit belongs (a level higher in the administrative hierarchy), if applicable. You can define these contact details of the business unit, if applicable. 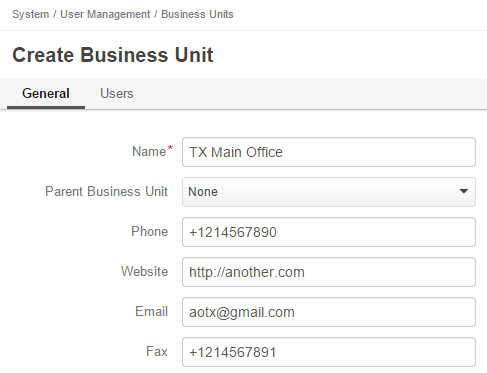 All the business units available are displayed in the Business Units grid (System → User Management → Business Units).